A weakened foundation is the No. 1 way that moisture will enter your home. 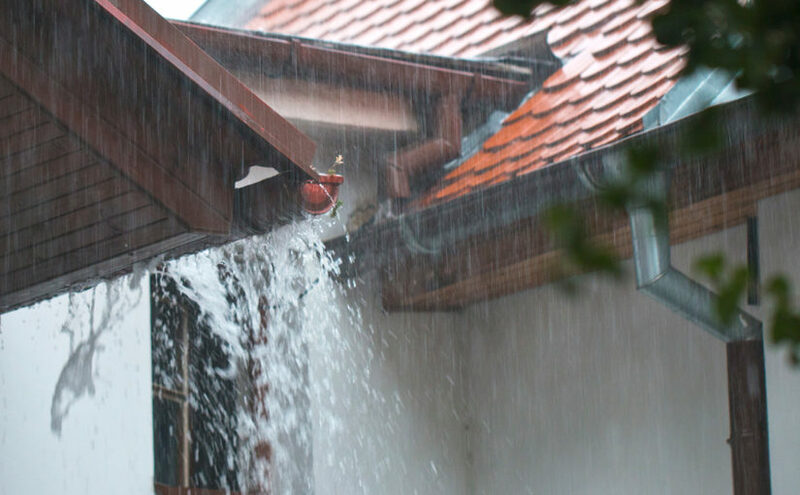 It is of the utmost importance to be sure any rainwater is directed AWAY from your home’s foundation! In the meantime, inspect your foundation. Look for cracks or other breaches to avoid water having a direct route to your basement. You may notice a hairline crack and think nothing of it. But keep in mind that even small cracks are a problem – they eventually turn into big ones. Stay on top of foundation damage! One of the most important defenses you have against rainwater damage is working gutters. They are critical for protecting your home from rain water damage. Clogged gutters will let rain water overflow directly onto/into the foundation and the ground surrounding your home. Water always finds the path of least resistance and if it isn’t directed away from your foundation, it will always move toward your foundation and find its way into your basement or crawlspace because they are below ground level and you can’t trump gravity once that water is at the base of your home. So be sure to clean your gutters regularly. It may not be your favorite task, but it sure beats expensive foundation work to repair rainwater damage! There are many types of tools you can invest in to help keep your gutters clear. It isn’t just the gutters that are important. Don’t ignore the downspouts. These are designed to complete the job of directing water away from your home and your home’s foundation. You can have the cleanest gutters on the block but if your downspouts are clogged, damaged, or too short, water will not be directed far enough away from your home and will easily pool around your foundation. Grading is a tough issue to deal with and we aren’t talking about back-to-school grades! Grading refers to the level of the ground around your house. The grade determines if storm water will flow away from your house (positive grading) or toward your house (negative grading). Sounds simple enough, right? Just be sure not to overlook the grading of a house when shopping for a new home. Home inspections should include grading. The inspector will look for signs of negative grading. However, if the conditions are extremely dry, signs of negative grading may not be obvious, so it is important to be well-informed because negative grading can require a lot of work to correct. Your house may not sit on a visible hill, but the ground surrounding your home should be graded to naturally direct water away from your home and toward a ditch, culvert or other drainage system “downhill” from your home. Poor grading will force excess rainwater to drain back towards your foundation – not a good situation! Even if you don’t have cracks in your basement or foundation, over time, the pressure from this groundwater will cause cracks and allow water to enter your basement. At least 95% of water problems below grade are due to miss-managed water above grade. Proper (positive) grading of at least a 2% grade can eliminate much of the potential for water damage to your basement or foundation. Properly installed and efficient gutters and downspouts are key factors as well. What to do when your home has poor or negative grading? Checking the landscaping around your home and improving the grade by adding ground near your home will help. Quality exterior waterproofing can also help combat a house with poor grading. Peeling paint: Generally the sealers and paints used on basement walls are porous. When high levels of moisture are present, the water is absorbed into the walls dissolving minerals present in the masonry. Minerals are crystalized and push the paint away from the wall’s surface causing the paint to peel. .
Cracking in the floor or wall: Most cracks are due to curing and settling and occur during the first 12-24 months of new construction. Cracks that occur later or that heave a slab upward generally indicate soil expansion. This expansion – frequent in areas with high clay content in the soil – can recur and allow moisture into your basement. Mold: Mold needs moisture to survive, so if you see mold, it’s a sure sign there is, or has been, excess moisture in your basement. Strange odors: While mold and mildew are generally visible, many times they lurk behind the walls or even under the carpet in a finished basement. Even if you can’t see it but you notice that damp “basement” smell, investigate the source. Many times a dehumidifier can help, but if water is getting in each time there’s rainfall, you need to address the issue on the outside as well. Your first line of defense against rainwater damage is your roof. However, most people “look up” when thinking about their roof; not everyone thinks of their roof as defense against rainwater damage to their foundation. Your roof’s integrity is critical for protection against rain water damage to both your home’s interior and its foundation. Inspect your roof regularly for damage or gaps. After heavy storms, look for potential damage caused by flying debris or falling branches. Even if there was a storm with high winds but no rain, check for loose or missing shingles, bent gutters damaged or detached downspouts. Even a small breach in your roof’s watershed system can cause major water damage, headaches and repairs. Most importantly, don’t wait on roof repairs. Just like you don’t want to let small cracks become large cracks in your basement or foundation; don’t let small roof repairs become large, costly ones by putting them off. The best way to keep your house protected from rain water is with professional waterproofing. EverDry Toledo can help with a FREE 20-point basement inspection! We’ll help you find out if your home is at risk for water damage and which solutions will best serve you.